I animated personal tests during the downtime between films. 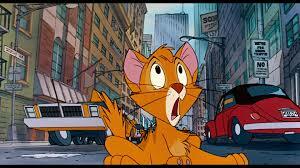 Eventually I was promoted to apprentice animator (called Animating Assistant) for “Oliver and Company“. I did a lot of research on kittens playing and thumb-nailed actions from video reference. The orphan kittens in the box were some of my first scenes. My tour de force came later in production when I was given a difficult scene. Oliver gets stuck in traffic and nearly run over. The cars were already animated in the computer. I needed to map the cars and then figure out where Oliver would run and panic. This was my introduction to creative problem-solving. My thumbnails were so tight that the scene worked very well. I learned the value of planning and research very early in my Disney career. Research was key for me in animation to create believable animal characters. It is still a key for me in creating stone sculpture animals. The situation is very similar since I start with a real animal and stylize the design of the animal and pose. I accumulated a vast knowledge of animal movement through my Disney research that serves me well as a stone sculptor. Planning is another skill that translates directly to stone sculpture. Planning is everything in a subtractive medium. Once you cut it off, it’s gone! I could never sculpt any of my pieces without planning, especially the ones with two figures carved from one stone, like “A Matter of Opinion“.